After leaving the San Diego State football team off its January pre-season poll, USA Today this week ranked the Aztecs No. 20 in its top-25 rankings. The rankings came after each of the Football Bowl Subdivision teams has had its spring practice. Every team in the FBS improved this spring, because “it’s hard to get worse” in the offseason, USA Today says. 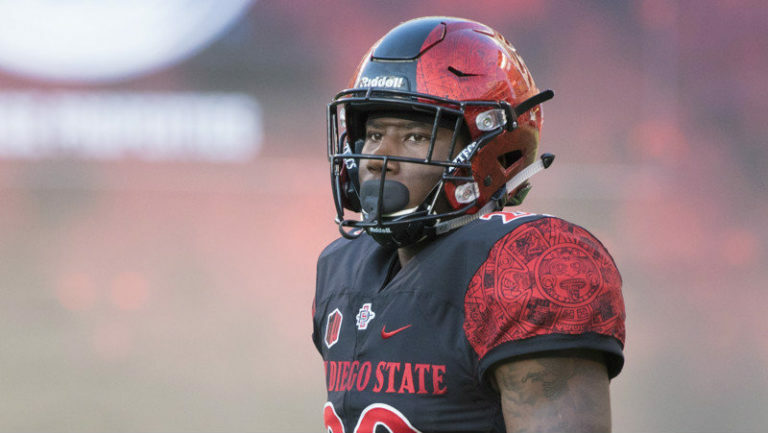 The biggest question mark USA Today has for the Aztecs is whether running back Juwan Washington will be able to fill the shoes of Donnel Pumphrey and Rashaad Penny. While Penny was the breakout star last season, Washington has proven himself more than capable the past two season. The junior running back’s numbers are on par or superior to Penny’s numbers entering his third season. Penny averaged 6.2 yards per carry, 15 yards per reception and 29.6 yards (with three touchdowns) on kick returns. Washington is entering this season averaging 6.6 yards per carry, 18.5 yards per reception and 26.1 yards (three TDs) on kick returns. Washington is touted as the next in line for the 2,000-yard-season club. “We talk to Juwan every week, telling him, ‘You’re next for the 2,000 club,’” said right tackle Ryan Pope, the Aztecs lone returning senior on the offensive line, after spring practice in April. Two of the Aztecs 2018 opponents are also ranked in USA Today’s pre-season top-25 rankings. Stanford is ranked No. 12 and Boise State No. 14, both rankings were unchanged from their January rankings.